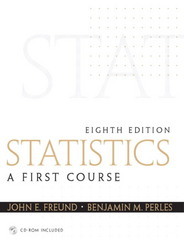 Statistics: A First Course 8 Edition This book offers a straightforward, “nuts and bolts” , introduction to statistics. The explanations are clear and simple and minimize calculations where possible. A diverse range of applications and examples are presented to make the materials appealing to a wide range of learners. The Eighth Edition features new problems, more real data based examples and exercises, and fuller integration of technology. For individuals beginning a study of statistics.